We made it to the top!!! What a view!!! 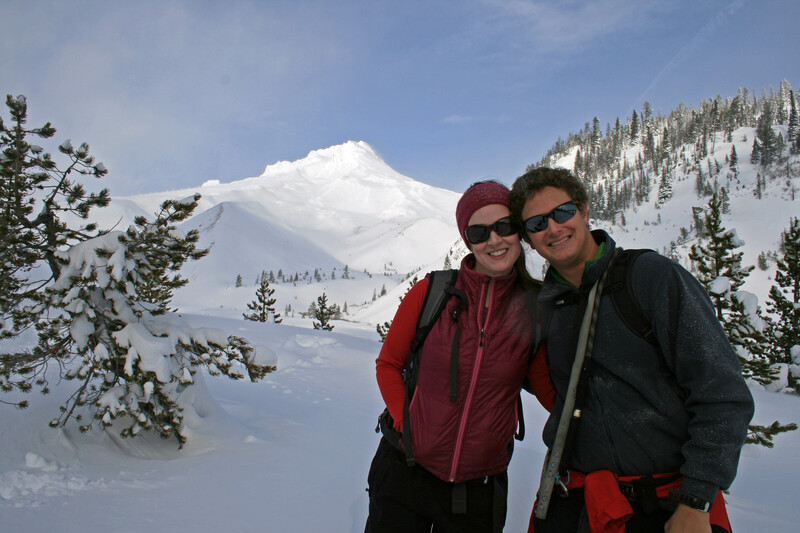 This winter season hasn’t necessarily been the best for outdoor pursuits, but Steve and I have managed to go snowshoeing at Vista Butte Sno-Park twice this season. It’s literally a twenty minute drive, at most, from our house, it’s relatively easy and it has pretty decent views of Mt. 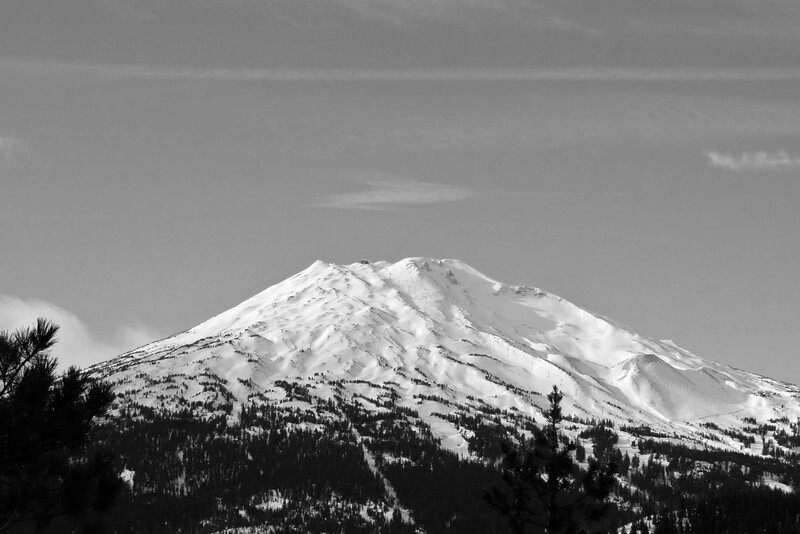 Bachelor, South Sister and Broken Top. Honestly we like this trail because it is little used, so we can let the dogs run around and play in the snow without having to worry about them getting in the way of other snowshoers/skiers. 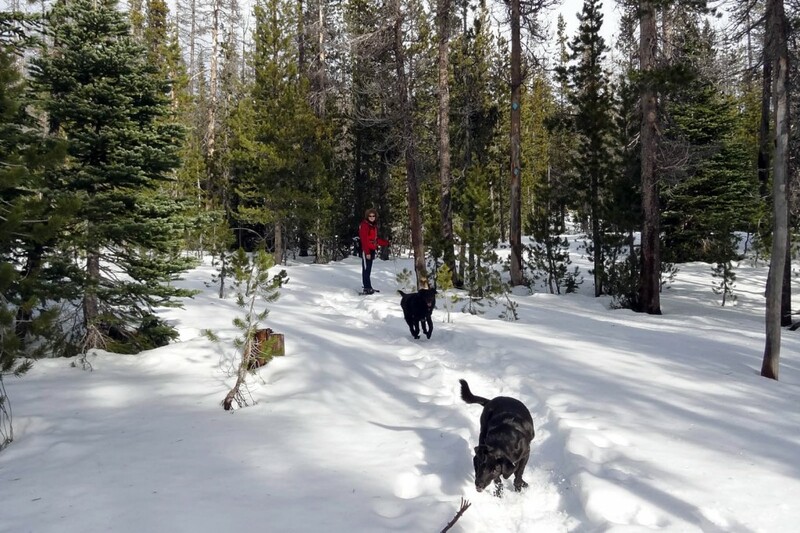 Dog Friendly: Well…if you go to the Deschutes Forest Service site they say dogs are restricted, but the trail is little used, so I don’t think there is a big deal…just don’t leave doggy landmines around for unsuspecting snowshoers/skiers. To get to the trailhead head west on Highway 46 for about 18 miles. The Vista Butte Sno-Park is on the right side of Hwy. 46 and is literally just a wide space in the highway directly before the turnoff for Sunriver (Hwy. 45). 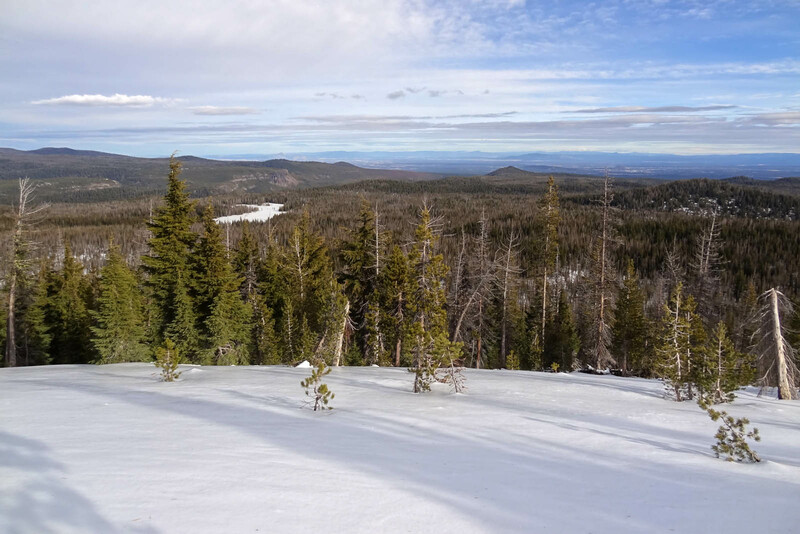 The parking area for Vista Butte will probably have a handful of snowmobile trailers, but don’t worry you only see/hear them in a couple of places on the trail. Sal and Jedi in action!!! For Steve and I this is a pretty easy snowshoe and I think most people in moderate shape will have an okay time with it. The trail gains around 700 ft over about 2 miles with the first quarter mile essentially completely flat. The trail gradually begins to gain elevation. Loving the fresh air!!! And don’t forget the blue diamonds mark the way. At about a half-mile in you will get a glimpse of your destination through the trees. And you’ll come to a junction with the lower loop trail. 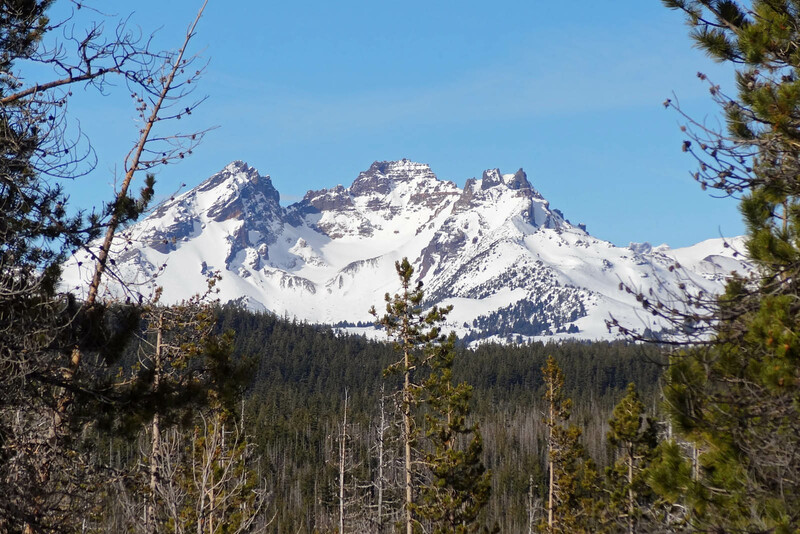 I’ve heard that the lower loop trail is more gradual, but we took the upper loop both times and it was beautiful, so I can’t tell you from experience. 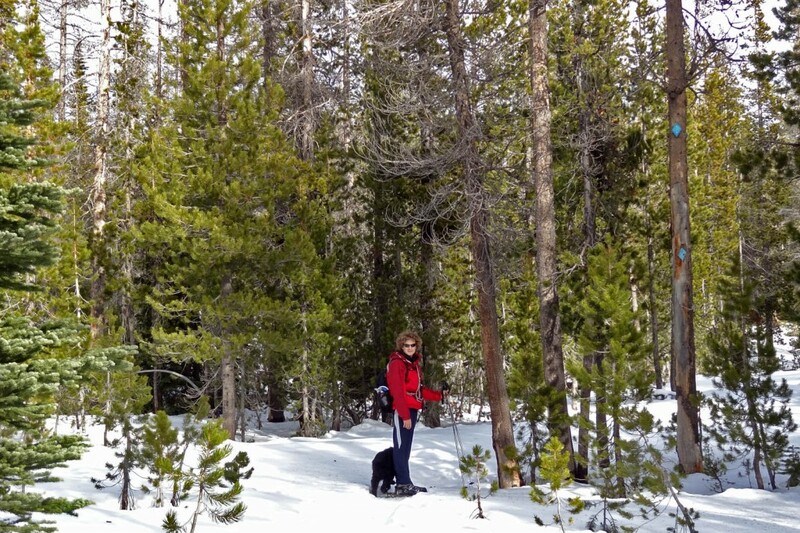 The trail does cross two snowmobile tracks, so be mindful and put your pups on leash, so no one gets hurt. 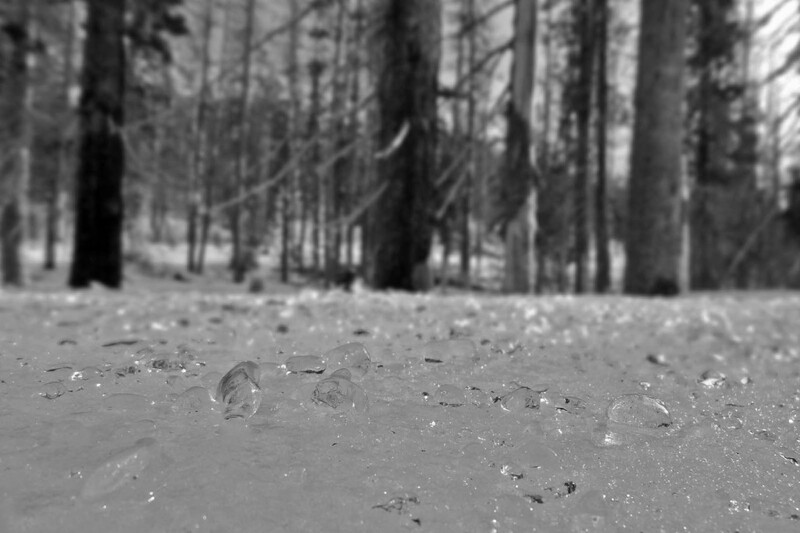 It was super icy when we went up the first time…pellets of ice everywhere. Cross the snowmobile tracks and stay on the Butte Trail. You’ll come to an area labeled Bruce’s Ballpark…I’m not sure what the story is behind that, but continue past it and head up the hill along the main trail. There are occasionally boot paths that take a short cut up to the top, but protect the plant life and stay as the trail….trust me it’s not much further. You will be stoked when you get to the top!!! 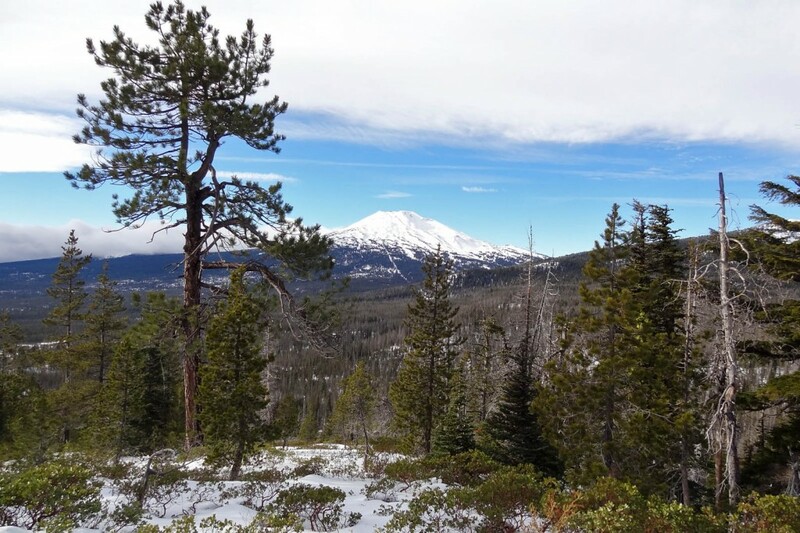 You’ll be blessed with views of Bachelor, Broken Top and South Sister. 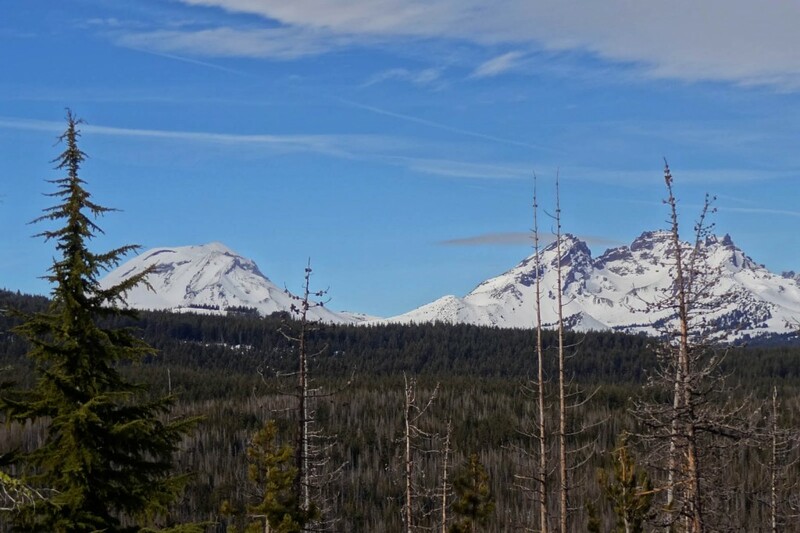 South Sister on the left and Broken Top on the right. Return the way you came, or maybe check out the lower loop trail. One more pic of the crazy ice!!! 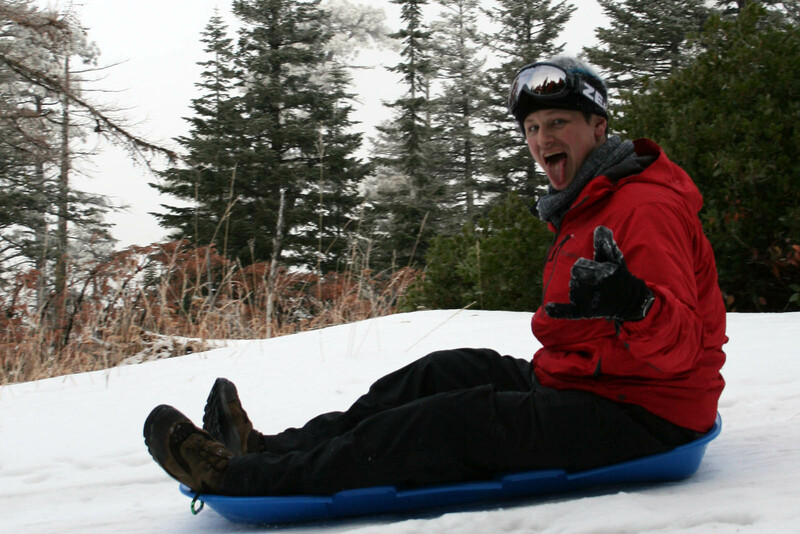 Instead of baking all Christmas Eve day, Steve, our friend Angie and I decided to head up to the mountain for some winter fun and I was only minimally harassed when I showed up to Christmas Eve dinner without pumpkin cheesecake. We were on a bit of a time crunch, so we decided on the White River trail because of it’s accessibility, shortness of the hike, and killer views of Mt. Hood. 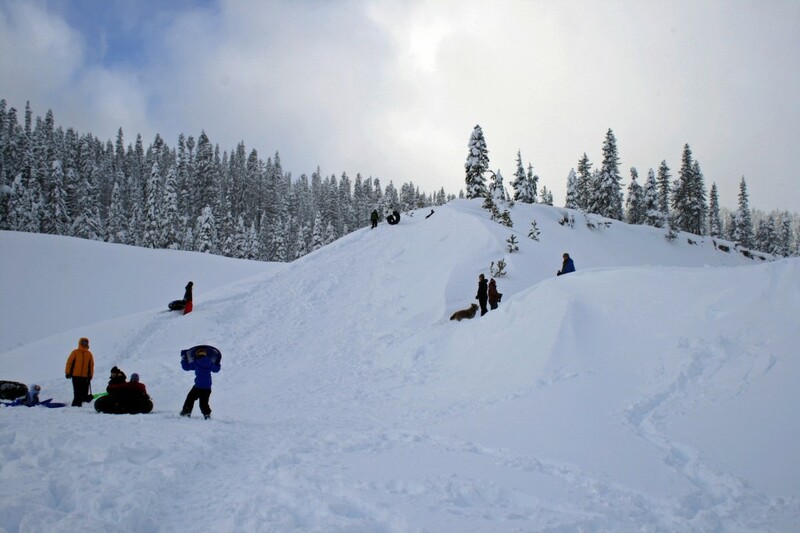 Apparently everyone else had the same idea because the Sno-Park was packed with families and their furry friends sledding, snowshoeing and cross country skiing. There was also a mountain rescue going on the same day because three people had gotten lost while snowshoeing to a cabin two days prior. The group was thankfully found before the day was over. From the parking lot you follow the masses along a road/path along the river and passed several sledding hills, one of which you actually hike up…and would be a total pain on cross country skis. This sledding hill is really the most difficult part of the snowshoe and you probably won’t even notice yourself huffing and puffing as you watch all of the tubers flying by. The sledding hill and most challenging part of the snowshoe. Continue along, either on the trail or off, if you prefer, until you reach the power lines that power Mt. 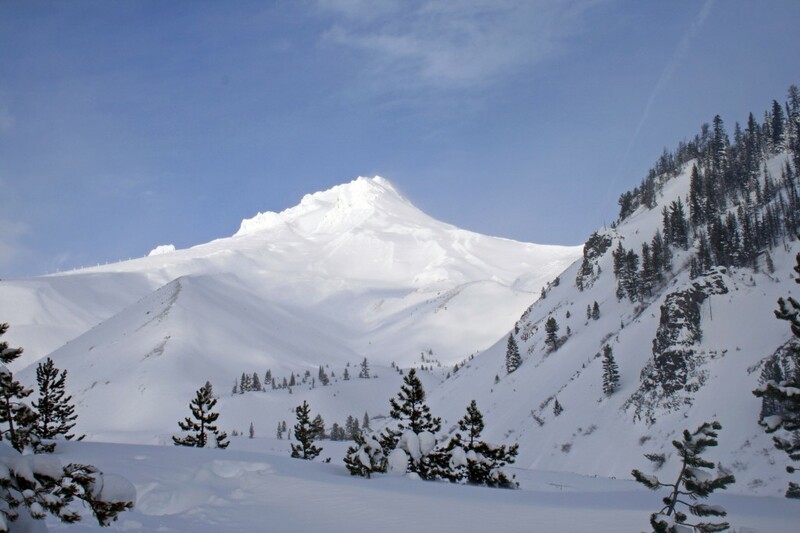 Hood Meadows Ski Resort. If you turn around at the power lines you will have completed about a 3 mile roundtrip. 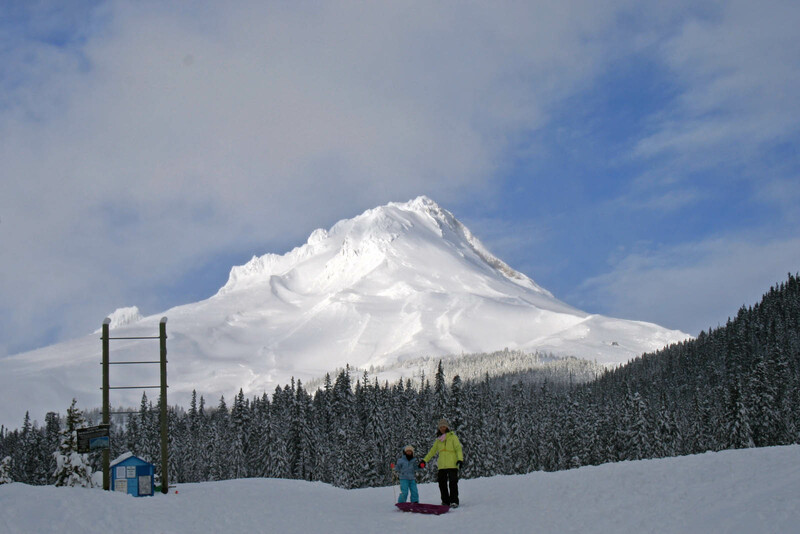 For more fun, continue further up the hill toward the mountain…you will be rewarded with amazing views of Mount Hood. Stopping for a break and a photo. On the way down Angie decided to give Sal a great big hug…so we took another picture. 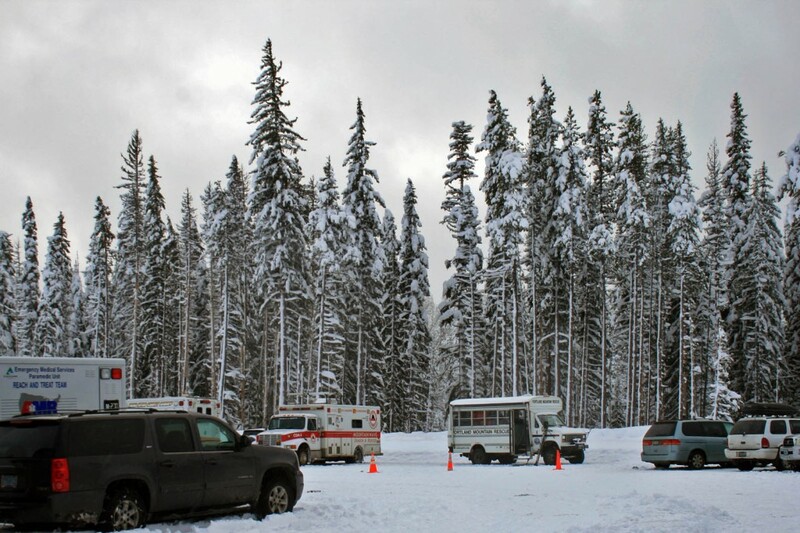 The parking lot was still very full with families out having Christmas Eve fun and with the volunteers, medical teams, and sheriffs department that were out looking for the lost snowshoers. Just makes you realize how important it is to be prepared and to pack the 10 Essentials. Portland Mountain Rescue, new trucks and the “entire” Hood River Sheriffs department were all still on the mountain when we were heading out. 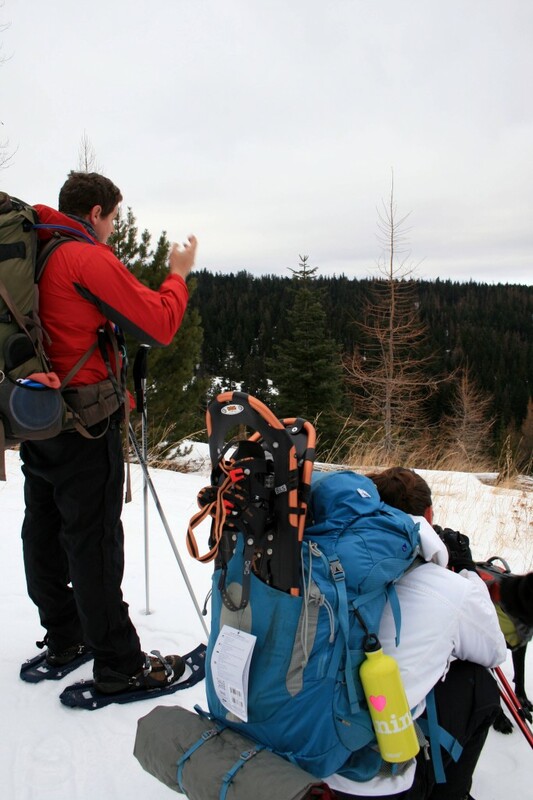 We really can’t wait till we get to go snowshoeing again…hopefully it will be sooner rather than later. and they rock. They get awesome traction and just the right amount of “float” and they even have “tails” that you can add on if you need some extra lift. Bottom line…they rock and they aren’t nearly as expensive as some of the others. We also added a couple extra strap bindings to ours, so now they are super secure and never come undone. 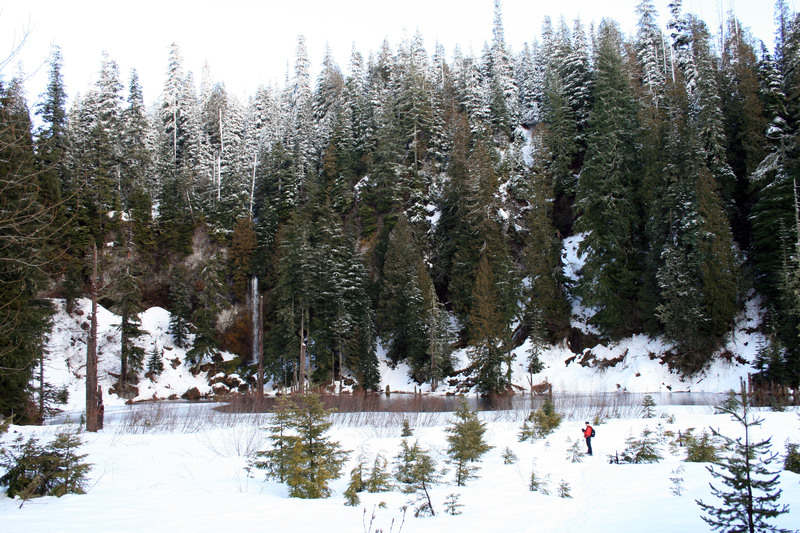 If you just want to try out snowshoeing rentals are usually super cheap…usually about ten bucks a day. Don’t forget your Sno-Park pass!!! The lookout was super cozy and we loved having a wood stove…. Dog Friendly: Yes, the fire lookout is exposed and the stairs are steep…Jedi cried the first couple of times going up and down the stairs…so we had to drag and/or carry him. Eventually he got it. 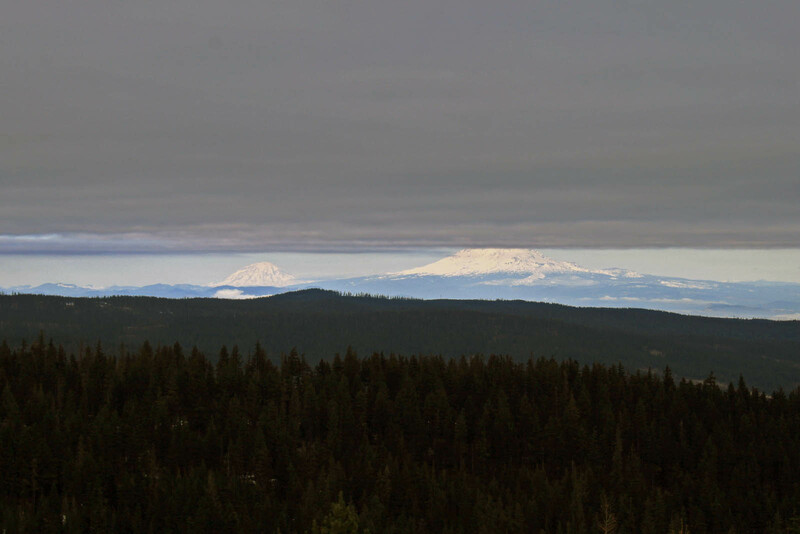 A couple mountains peaking through the clouds on the road up to Five Mile Butte fire lookout. 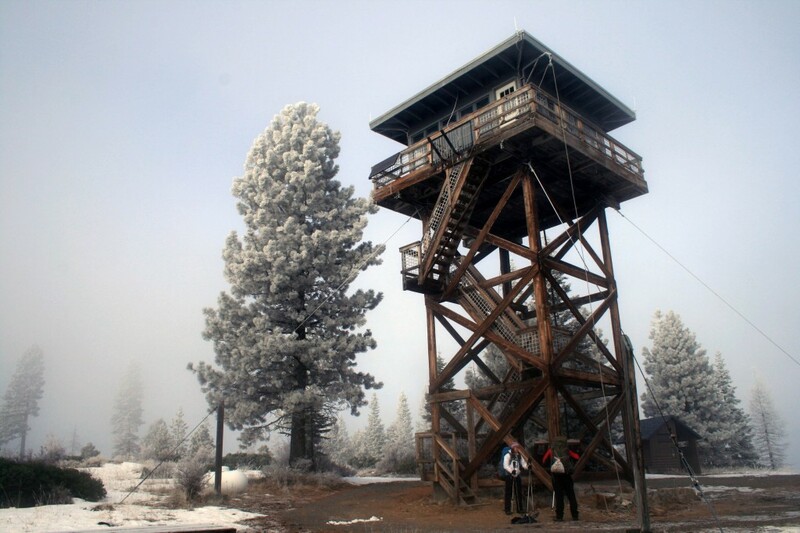 To get to the fire lookout it’s a 3 mile hike along a road that begins across from the Billy Bob Sno-Park. 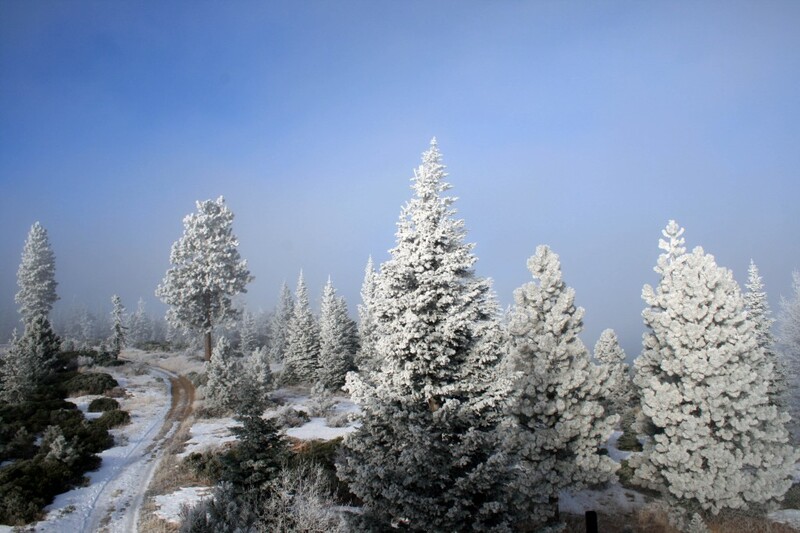 The lookout sits at 4,627 feet and when it’s not cloudy there are some great mountain and forest views along the way. Taking a break on the road up to the fire lookout. As the hike is a solid three mile uphill trek we stopped for a couple of breaks along the way. 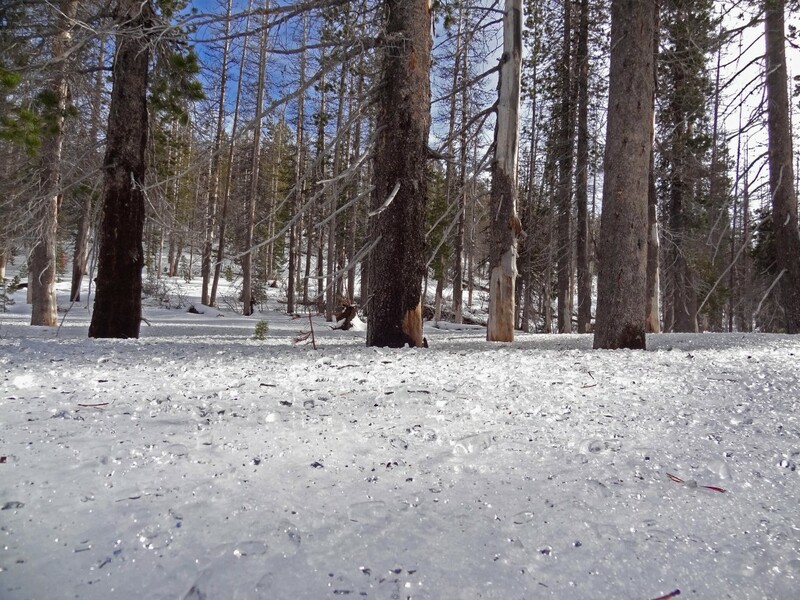 In early December, when we went, there wasn’t a ton of snow, but it was definitely icy and we were happy we brought our Black Diamond Trekking Poles and MSR Snowshoes . View of the access road from the lookout. We made it!!! The lookout sits about 40 feet off the ground and has some pretty steep and narrow stairs. 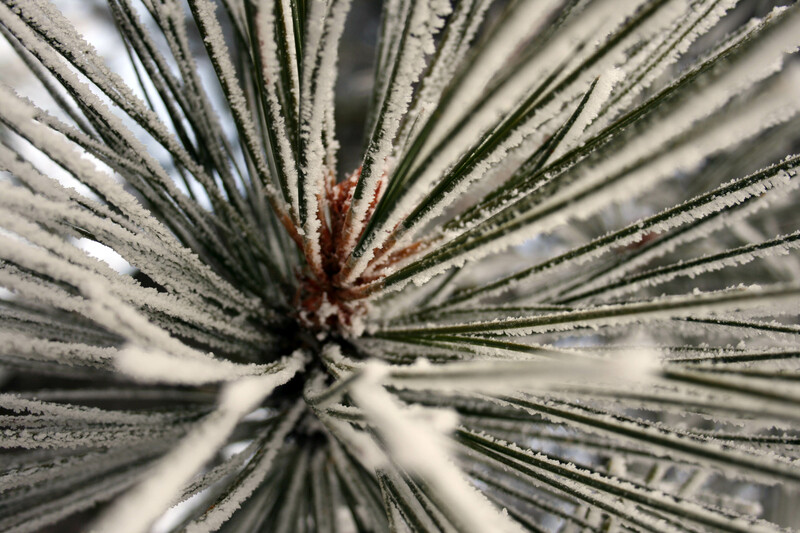 We were happy to have the wood stove because the temperature was dropping fast and we wanted to melt some snow to make warm drinks. My Sorel Pac Boots boots were super comfy and warm….no cold toes for me. We spent most of the evening reading over the old guestbooks, chatting, and drinking spiked apple cider and hot cocoa. The lookout stayed toasty all night long and we all slept great. 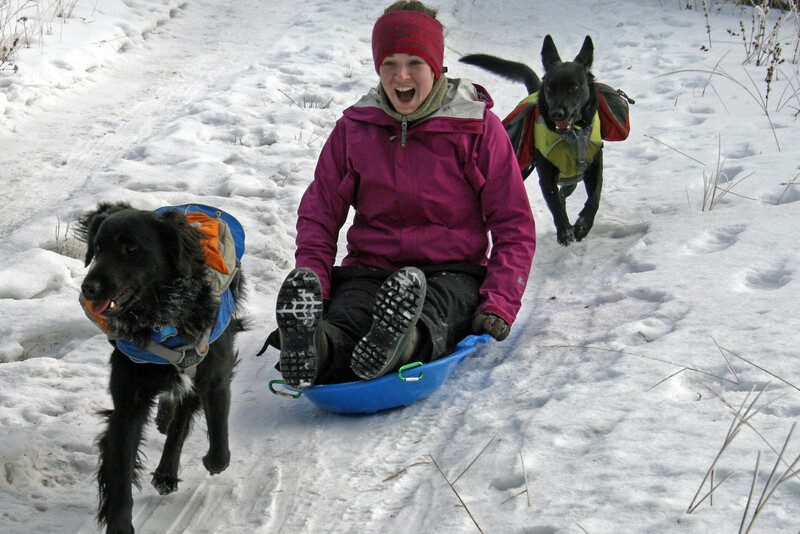 We found a beat up plastic sled in the wood shelter and took advantage of the icy conditions. We found a sled in the wood shed and had to get a couple of good runs in before we headed out for the day. The dogs were a little freaked out by it…but we had a great time!!! Super slick sledding….thank goodness for the sports setting on my camera!!! Jedi rocking his ice beard after our hike back down from the lookout. Back at the Sno-Park we finished off the last of our hot chocolate…that was still piping hot after all of our sledding and the hike out. The dogs stayed toasty with their packs layered over their winter jackets and were rewarded for all of their hard work with some treats when we got back to the car. Partially frozen June Lake on the South side of Mount Saint Helens. 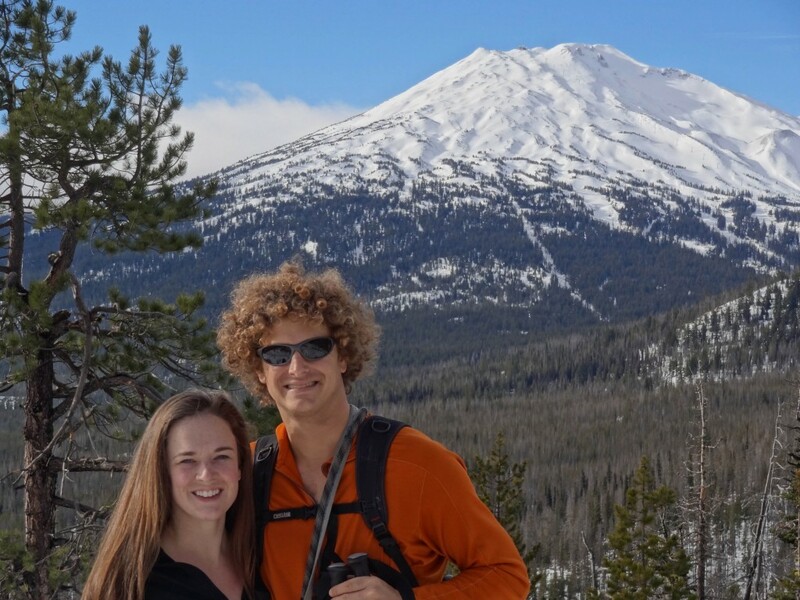 With hiking season coming to an end it’s time to dust off our MSR Snowshoes and hit some of our favorite snowshoeing spots. We found out about June Lake from a woman that was hosting a Washington Trails Association/Mount Saint Helens info session at REI and the trail doesn’t disappoint. 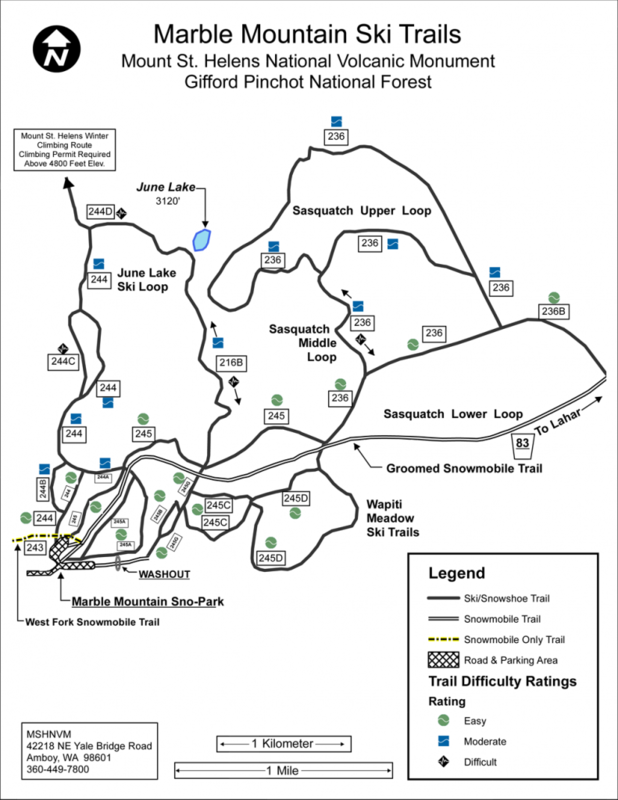 If you register for a climbing permit at the Lone Fir Resort (in Cougar, WA) before heading up you can even summit Mt. St. Helens on the same trip…just make sure to get an early start. I’ll have to work on convincing Steve to summit Mt. St. Helens on our next trip to June Lake. 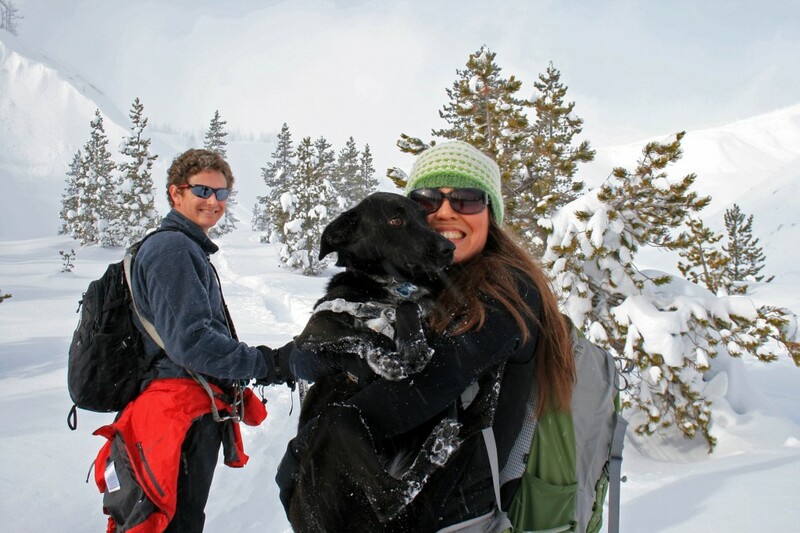 Dog Friendly: That depends on your dog….are they used to the cold and snow? Jedi is our wussy dog and he did just fine till the end when he was tired. Sal, our young crazy one, had the time of his life. 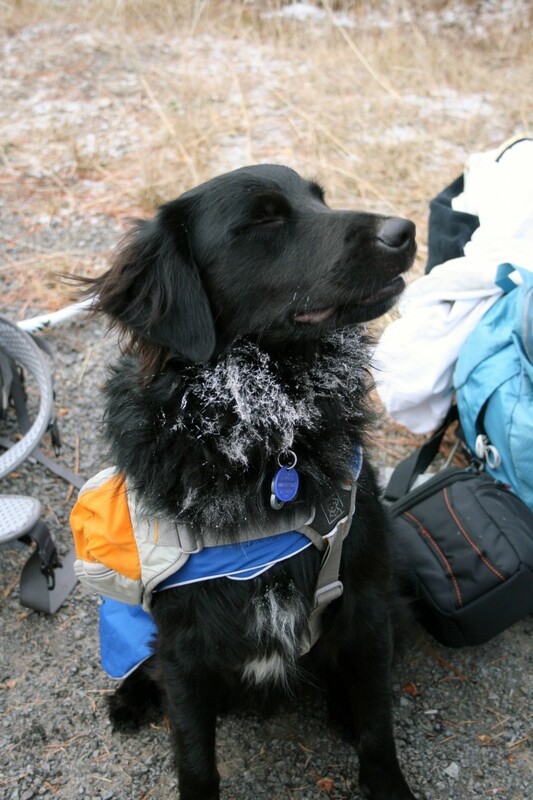 Our dogs wear jackets on snowshoe trips and we pack extra food for them because they work extra hard….postholing a ton. Cons: I imagine it can get pretty crazy on the weekends….the parking lot is huge!!! 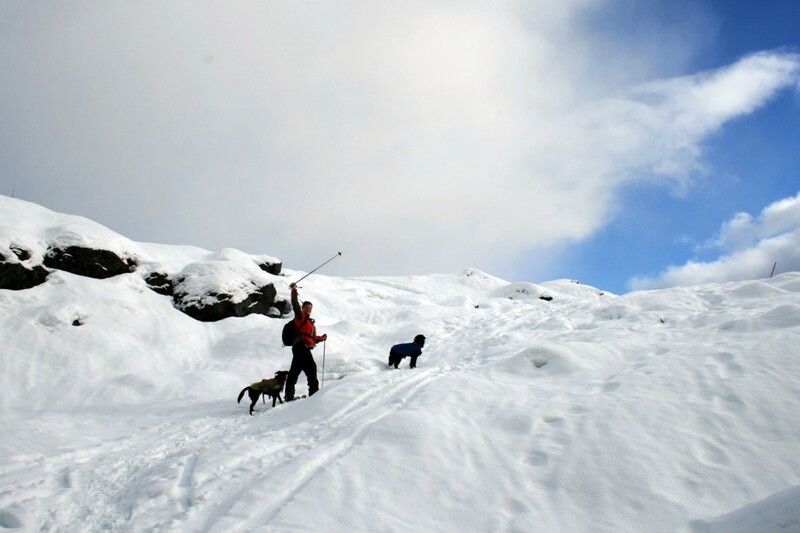 Steve and the pups ascending the Swift Ski trail, which is also the winter summit trail on Saint Helens. 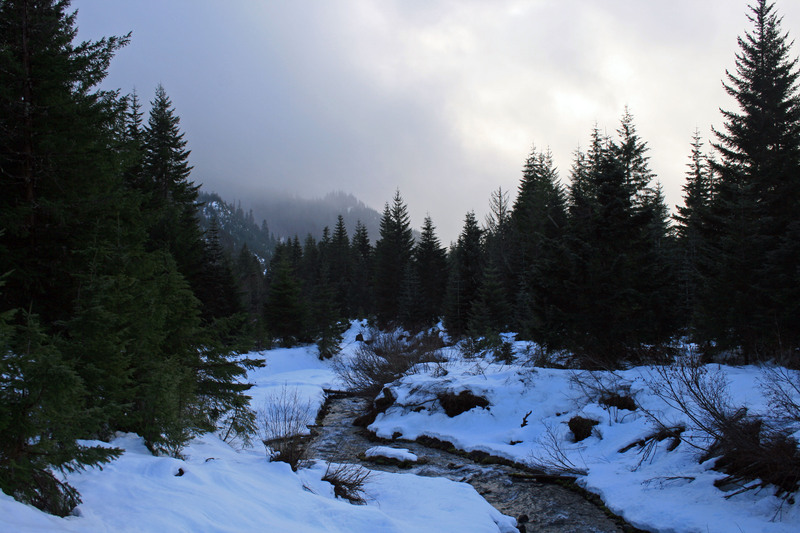 The trail begins at the Marble Mountain Sno-Park in the Gifford Pinchot National Park on the south side of Mount Saint Helens. If you head up to Marble Mountain I would advise driving a 4-WD or packing chains….I have gotten stuck driving my little Toyota after an early November snow and I’ve also been up there later in the season and the road is perfectly plowed all the way to the park, so check the road conditions (and trail conditions too) before heading out. When we headed out to the mountain it was following a period of steady snow, while the Swift Creek Trail (#244) showed signs of use, the Pika Trail was only partially marked. So we blazed our own trail, utilizing our GPS of course, over to June Lake. A snow storm was moving in and turning the sky black, so we hoofed it over to the lake, but it began dumping before we made it. 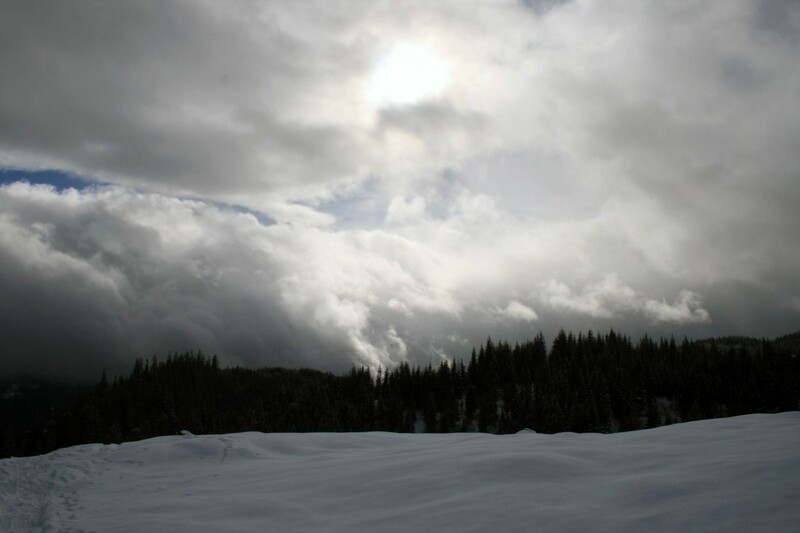 The storm front moving in…good bye blue ski…hello gigantic snowflakes!!! June Lake is a gorgeous little lake with a pretty waterfall pouring off the hillside into it. The June Lake Trail (216B) follows a pretty little creek until it reaches the road. We decided to explore the trails on the other side of the road for a bit, but were soon cold (and the pups were getting cold and tired too), so we ended up following the road back to the parking area. We could have taken the Pine Martin Trail (#245E) back to the parking area, but our pup, Jedi, was tired of postholing, so we opted for the road which was great: no postholing, pretty views….and surprisingly no snowmobiles. The June Lake ski trail follows this pretty little creek down the hill. Finally a break in the clouds allowed us a peek at Mt. St. Helens. 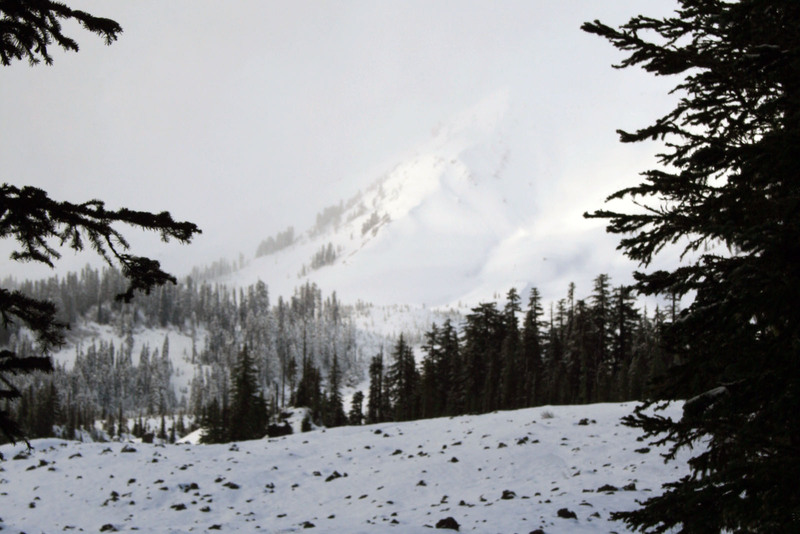 For an in hand guide check out Snowshoe Routes Washington .